NEW YORK (CNN) -- A page of history has been turned and a tsunami of goodwill is rumbling across the Atlantic to the Pacific, from pole to pole and across our many continents. 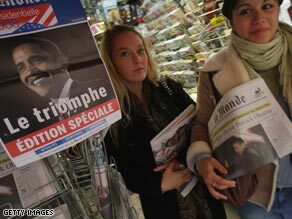 Barack Obama's victory was front-page news around the world Wednesday. President-elect Barack Obama has brought America back, and yet he inherits a monumental mess. No sooner had he said "I do" than world leaders, pundits and of course the media started weighing in with their wish lists. The Times of London said Obama had revitalized U.S. politics. In Germany, Der Spiegel called Obama's rise "astonishing," while the Times of India called Obama an "advocate of strong partnership with India." Al Jazeera said Obama had "surfed to power on a wave of voter discontent generated by the failures of President George Bush and the Republican Party" and added that he faces "unique challenges." It continued that his country was "sick of war." At the same time, he has to tackle a Rubik's Cube of America's overstretched and fatigued forces, to figure out how to redeploy more to wrest victory from the jaws of defeat in Afghanistan. And next door in Pakistan, he must devise a strategy to rescue a failing state, bolster democracy and simultaneously crack down on al Qaeda and Taliban militants there. Then there's the decades-long Middle East peace process. Most credible observers in the United States and abroad believe there is little chance of achieving actual peace without a solid U.S. return to a peace process between Israel and the Palestinians. Iran officially reacted to Obama's victory with cautious optimism, praising the end of what it termed "Bush's defeated policies." It added that Obama "can play an important role in future relations between the U.S. and Asia and the Middle East." Here in America, many former secretaries of state and other officials also believe in playing that role. They say an Obama administration should explore the possibility of engaging with Iran and even restoring diplomatic relations as a way to help solve challenges such as Iran's nuclear program and its role in regional power politics in Iraq, Afghanistan and the Middle East peace process. And then there are the other items in his in-tray, none of which are small matters. Obama is being urged to lead on climate change, close down the Guantanamo Bay prison in Cuba and restore America's position as the world's main defender of human rights, and work through all of this amid the worst global financial crisis in 100 years. It is no enviable task, but America's next president starts with a world of best wishes.